Unleash a tidal wave of low-end punch on the masses. 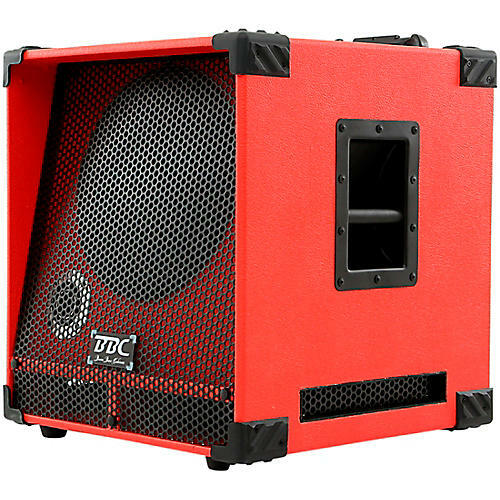 Designed for those who want to really shake the walls and rattle the ceiling, the Boom Bass Cabinets Tank 1215 is a 4-ohm powerful cabinet that comes loaded with a 12 in. neodymium driver and a 15 in. neodymium driver along with a 300W horn. This cabinet has extra sound ports on the lower sides of the cabinet creating 180 degree sound from the lower woofer. It also has a unique interior structure design that allows the woofer to work at extreme high volumes with very little effort. This design allows this cabinet to perform at very loud and hard volumes with almost no cabinet vibrations. This means you can now set your lightweight amp on top and never worry about it vibrating off the cabinet. This cabinet also features a tilt-back front baffle which allows sound to travel at a slight upward angle, perfect for the times when you have to stand close to or right over the cabinet. This is a powerful, full-range cabinet that can handle both small and very large rooms. It comes standard with our retractable handle and our rear recessed corner casters for easy mobility, perfect for the working musicians.